An all-purpose blend of fast, medium, and slow-digesting proteins that can be used throughout the day! True Nutrition proudly presents our signature Female All Day Protein Formula, an all-purpose blend of fast, medium, and slow-digesting proteins that can be used at any time throughout the day! When combined with a rounded diet and exercise routine, the Female All Day Protein Formula can be used to help increase daily protein consumption while satiating hunger and offering time-release protein absorption over a period of several hours! Uses: Meal Replacement: Provides 26g of time-sustained protein! Taste: Mild milky taste that goes great with any flavor! Mix 1 Serving (About 1 Scoop) 1-2 times daily or as needed in 8-12floz of water, juice, or milk. Stir or shake and enjoy! Micellar Casein (Milk), Whey Protein Isolate (Milk), Whey Protein Concentrate (Milk), Egg White Protein, Lecithin (Soy). 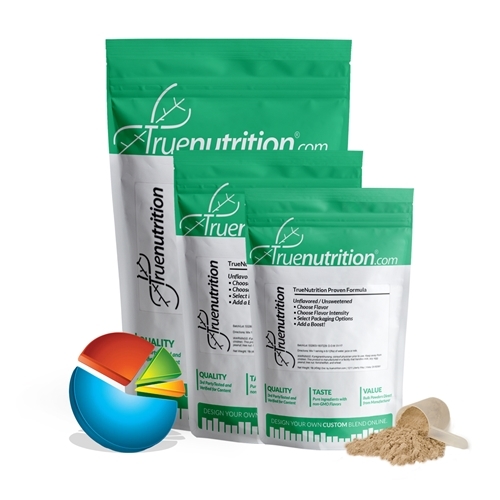 TrueFlavors: Flavoring (Natural Flavoring Extracts, non-GMO Tapioca Maltodextrin, Guar Gum, Gum Acacia, Stevia). May also contain: Cocoa Powder. Natural Flavoring: Flavoring (Natural Flavoring and Coloring, Maltodextrin, Stevia). May also contain: Cocoa Powder. Other Flavoring: Flavoring (Natural and Artificial Flavoring and Coloring, Acesulfame Potassium, Sucralose, Modified Food Starch, Silicon Dioxide, Maltodextrin). May also contain: Guar Gum, non-GMO Tapioca Maltodextrin, Cocoa Powder. CONTAINS: MILK, EGG, SOY. Although this product may not contain one or all of the following, this product is manufactured in a facility that handles milk, soy, egg, peanut, nut, tree, fish, crustaceans/shellfish, and wheat products.